The Weekend Freewrite- 2/23/2019 - Part 3 - The Dramatic TwiststeemCreated with Sketch. I and the @freewritehouse are supporting the @steemitbloggers aka #powerhousecreatives for the delegation from @theycallmedan. Make sure you visit the Freewrite House!!! If you want to do the full weekend freewrite and you haven’t done “The First Sentence” don’t read on, look for the green graphics. Or if you want to do a single prompt freewrite, look for the red graphics. Now comes your dramatic twist - the conflict. Paste a link to your freewrite in the comment section of this post. What do you think? Do you like this weekend freewrite challenge. It does go a bit deeper than the one word or one prompt freewrite. A bit more challenging. But so much fun!! Prompts are taken from books, your suggestions and my brain. I am presenting a three-part prompt one of the weekend days (my weekend). I will try for Saturday since some of you are many hours ahead of me. But often, my Saturdays are very busy - then, it will be on my Sunday. Hope you are having fun with this!! 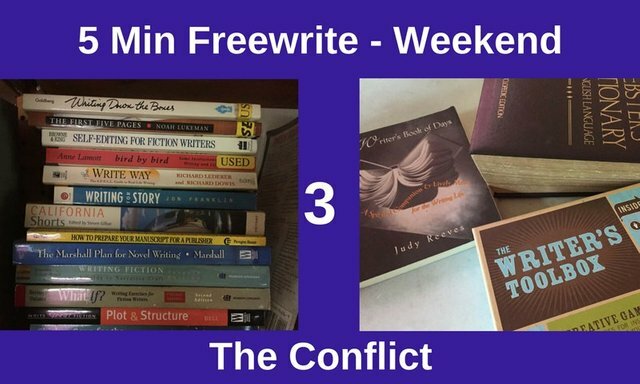 Remember, drop the link to your completed three prompt freewrite under this post. Please visit as many other freewriters as you can!! Hey @mariannewest ... nice to see this post in the sea. If I do this one it will be my first. I see people enjoying and improving their freewrite skills every week. A great incentive to be a part of this. I too have voted and believed members like yourself in @steembloggers come from a variety of communites and ALL have a lot to offer Steemit! You are a wonderful example. thank you so much!! On all counts!! Here ya go! It's always a pleasure. I do not like falling behind... Sorry to keep everyone waiting! Remember to enter the Loyal Reader Rewards for a chance to earn 1 Steem Basic Income Share each week!